LONDON, Ont. - In the background, six oil-painted panels of stylized rural scene in greens and blues, water and trees and sky hang on the wall at London Regional Art and Historical Museum. In the foreground, resting on the floor and sandwiched between the landscapes, are five black-and-white photographs of similar size. The first is of a color-tinted woman in a green jacket passing a sign that says "Woodstock: The Friendly City." The next two are close-ups of city hall and a provincial court house, all concrete and glass and straight lines. In the fourth photo, the court has dropped to the background; a Canadian flag flies overhead, and a sign says "private parking." The final shot shows the tinted woman leaving the black­-and-white city. "Thank you. Call again." says a sign. 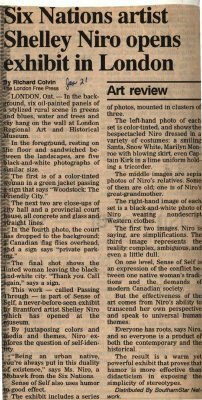 This work - called Passing Through - is part of Sense of Self, a never-before-seen exhibit by Brantford artist Shelley Niro which has opened at the museum. By juxtaposing colors and media and themes, Niro explores the question of self-identity. "Being an urban native, you're always put in this duality of existence." says Ms. Niro, a Mohawk from the Six Nations. Sense of Self also uses humor to good effect. The exhibit includes a series of photos, mounted in clusters of three. The left-hand photo of each set is color-tinted, and shows the bespectacled Niro dressed in variety of costumes: a smiling Santa, Snow White, Marilyn Monroe with blowing skirt, even Captain Kirk in a lime uniform holding a tricorder. The middle images are sepia photos of Niro's relatives. Some of them are old; one is of Niro's great-grandmother. The right-hand image of each set is a black-and-white photo of Niro wearing nondescript Western clothes. The first two images, Niro is saying, are simplifications. The third image represents the reality: complex, ambiguous, and even a little dull. On one level, Sense of Self is an expression of the conflict between one native woman's traditions and the demands of modern Canadian society. But the effectiveness of the art comes from Niro's ability to transcend her own perspective and speak to universal human themes. Everyone has roots, says Niro, and so everyone is a product of both the contemporary and the historical. The result is a warm yet powerful exhibit that proves that humor is more effective than didacticism in exposing the simplicity of stereotypes. London Regional Art and Historical Museum.